Now that you've listed your maps in the Avenza Map Store, they are available to hundreds of thousands of Avenza Maps app users to browse, search and buy. However, that's not the only way potential customers can find them! Think of the Map Store as your own digital delivery fulfillment system. You can drive traffic to the store listings from your web pages, social media and even cross-promote digital versions from e-commerce products. Whether you choose one method or use a combination of all three, the more visible you make your Map Store Listings, the more maps you'll sell. Here are some ways that you can point digital map buyers in the direction of your map store listings. 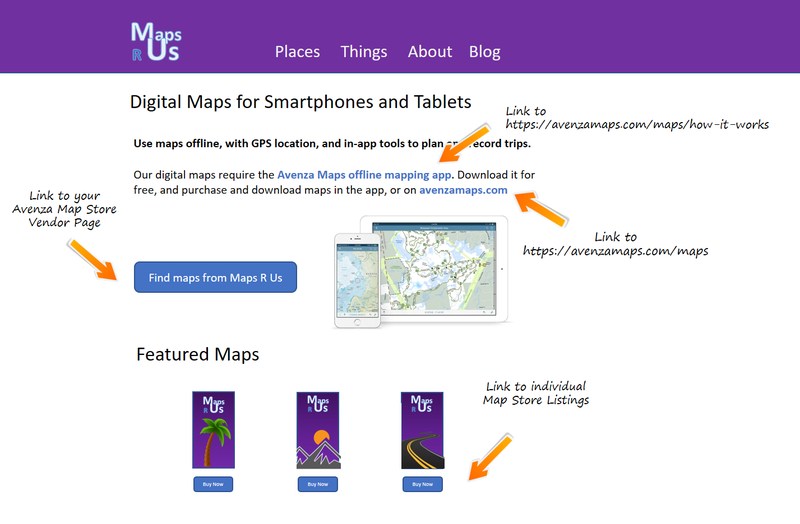 Create a new page on your website dedicated to digital maps. Make it bold and add it to your website's navigation, or keep it more subtle with a simple 'Digital Maps' item in the footer item. Where this page lands really depends on the structure of your site, and how prominent you want your digital maps to be. Either way, don't forget to create some links to this page from other areas of your website. 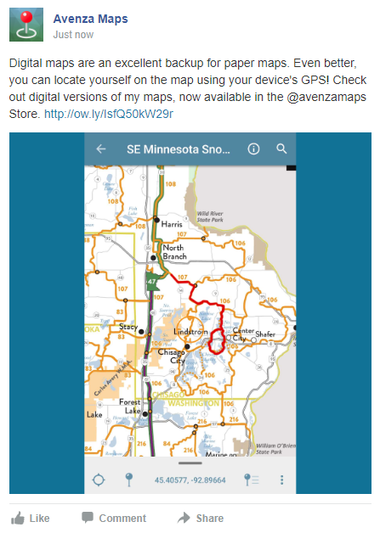 Add a visual element to make your digital maps stand out. 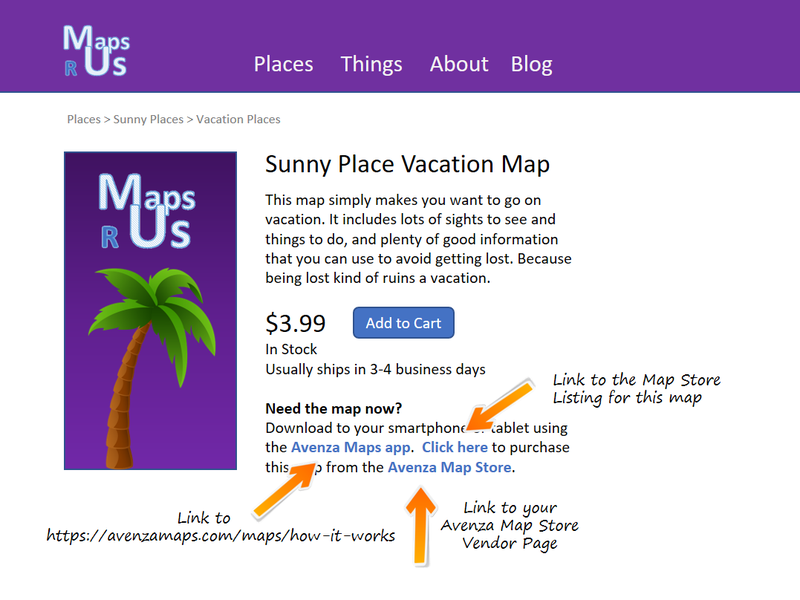 One way to do so is using the Avenza Map Store badge, with a link to a specific map, or to your Vendor Page. Here are some snippets that you paste into your webpage code to create links to individual maps and bundles, or to your Vendor Page. If you have an e-commerce site on which you sell paper maps, add a link to the appropriate digital map in each product description. Use it as an opportunity to up-sell the digital version as a backup for paper maps, or as an alternative for customers who don't want to pay or wait for shipping. Customers will appreciate having options and may even decide to purchase both! Be sure to note that the buyer will be directed to the Map Store to complete the digital purchase. Your social media accounts can be valuable sources of traffic, and a great way to introduce your digital maps to your followers. Tag @AvenzaMaps in your captions, as in the examples below, to also reach our network of followers. 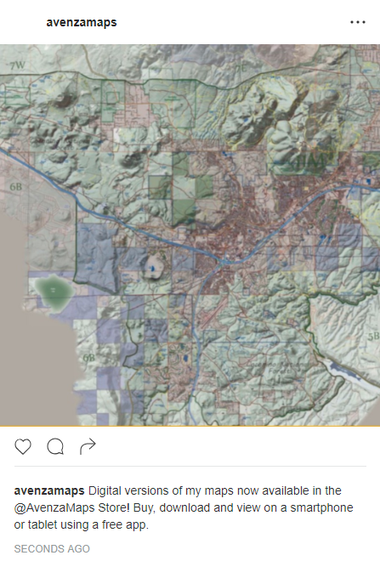 You can use images of your listed maps - could be a screen capture of a portion of the map, a cover image, or anything else you feel is a good representation of the item. Digital maps are an excellent backup for paper maps. Even better, let's you GPS to always locate yourself on the map! Digital versions of my maps are available in the @avenzamaps Store! Digital versions of my maps are now available in the @avenzamaps Store! Buy, download and view on a smartphone or tablet using the free app, and locate yourself even when offline. Your next adventure could be here. All of our digital maps are now available on the @avenzamaps Store. Search the map store to see my available titles. 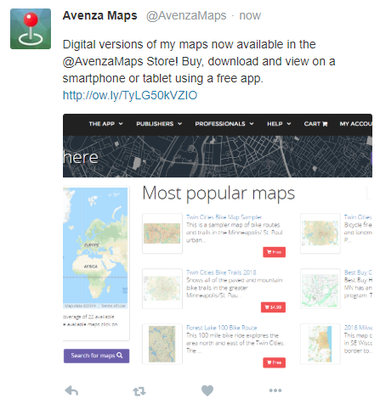 Use any of these images and links to help promote your digital maps in the Avenza Map Store.